"Whoever you are, whatever side you’re on, if you care about the American west and what’s happening to it, read this book." An extraordinary inside look at America’s militia movement that shows a country at the crossroads of class, culture, and insurrection. In a remote corner of Oregon, James Pogue found himself at the heart of a rebellion. Granted unmatched access by Ammon Bundy to the armed occupation of the Malheur National Wildlife Refuge, Pogue met ranchers and militiamen ready to die fighting the federal government. He witnessed the fallout of communities riven by politics and the danger (and allure) of uncompromising religious belief. The occupation ended in the shooting death of one rancher, the imprisonment of dozens more, and a firestorm over the role of government that engulfed national headlines. In a raw and restless narrative that roams the same wild terrain as his literary forebears Edward Abbey and Hunter S. Thompson, Pogue's Chosen Country examines the underpinnings of this rural uprising and struggles to reconcile diverging ideas of freedom, tracing a cultural fault line that spans the nation. "In Chosen Country, Pogue does an exceptional job of explaining how one of the most bizarre and divisive events in recent U.S. history came to pass...His book is remarkably evenhanded, but he doesn't shy away from exploring his own history and emotional response to the events in Oregon." "At a time where right and left, urban and rural seem hardened into distinct sides, Pogue serves as a translator." "Part Graham Greene, part Ed Abbey by way of Vice, James Pogue is the unlikely reporter-narrator of this compulsively readable, incisively written exposé of the homegrown American militia movement and the mini-insurgency it waged at Oregon’s remote Malheur National Wildlife Refuge in January, 2016. Embedded in the standoff as it unfolded, Pogue straddles a fine ethical line between maintaining friendships with the participants while reporting for the New York Times. But his disarmingly casual tone masks a deeply thoughtful analysis of the movement’s historical antecedents and its messianic Mormon roots. Chronicling with empathy the widespread rural powerlessness and alienation that gave rise to the Bundy family, Pogue never loses sight of the movement’s devotion to its own victimhood. He is particularly effective in revealing the cult of personality that built up around Ammon Bundy, who sees angels directing his actions and lets others take the fall for his grandiosity. Whoever you are, whatever side you’re on, if you care about the American west and what’s happening to it, read this book." "Keenly reported and rendered in novelistic detail, James Pogue’s Chosen Country provides an intimate and troubling portrait of American discontent." "Chosen Country is an urgent and captivating dispatch from inside an American insurgency led by self-made prophet Ammon Bundy. But at its most compelling, it also provides a window into the psyche of white men searching for a cause and finding it in the mythology of the West, which has always been our most potent vision of American freedom." 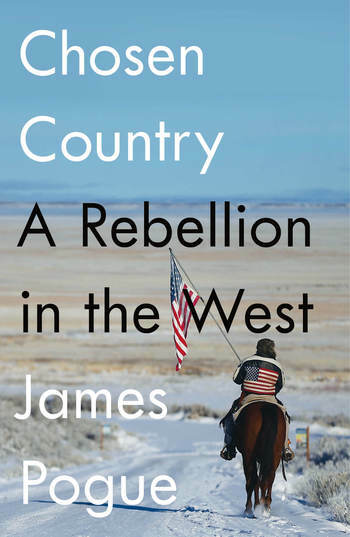 "Pogue, a journalist and raconteur, provides a firsthand account of the 2016 anti-government standoff at Oregon’s Malheur National Wildlife Refuge. . .Pogue’s personal anecdotes and brief history of western land-use conflicts add flavor and context. . . .Although he did not agree with their tactics, Pogue was able to portray the central characters with more dimension than found in news accounts." James Pogue has written for The New Yorker, The New York Times Magazine, Granta, the New Republic, and Vice, where he is a contributing editor. His work has been anthologized in n+1’s City by City. He lives in New Mexico. Chosen Country is his first book.